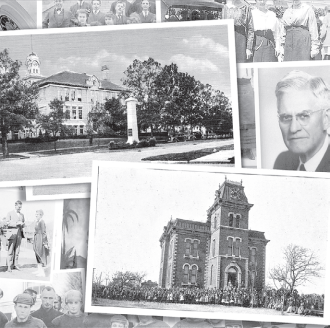 The book looks at 134 years of life in Denison through the story of the two different schools that stood in one block at the heart of downtown. The first of theses was the first free, graded public school in Texas. It was built in 1873–74, after a raucous campaign to decide which was needed more—a school or a jail. By 1913 the school was overcrowded and outdated, and the school board hired a noted Texas architect, Arthur Osborne Watson, to design a replacement in Mission Revival style. With additions in 1927 and 1939, the 1914 Denison High School building stood until 2007, when it was razed following a twenty-year, on again, off again campaign to preserve the building. Two Schools on Main Street examines the architectural design of the two buildings, as well as the activities that went on within them. The book’s account of the desegregation in the Denison public schools following lawsuits by the local chapter of the NAACP is a notable contribution to the record of those times. In part, as a result of those ultimately successful efforts to end segregation in Denison education, the school administration converted the 1914 high school to a junior high in 1954. The building closed in 1986. At the book’s center are two special sections. In one, twenty-four graduates from the years 1912 to 1960 share funny or touching memories of their school days. Especially noteworthy is the memoir by Dr. Charles Andrews, who was both student and teacher at the 1914 school. Andrews coached football in Denison, and retells accounts of Denison vs. Sherman games. Another section presents photos of over 4,000 graduates of the two schools, organized year by year, making the book a kind of mega-annual where it is easy to find friends and family. The book’s authors, Mavis Anne Bryant and Donna Hord Hunt, are a dream team for Denison history. Both attended the 1914 school, and Hunt graduated there. Both have delved deeply into local history sources, and both have written for Texoma Living! Hunt, a former editor of the Denison Herald, has a journalist’s eye for the telling anecdote and story line. Bryant, a clinical psychologist who was once a news reporter in San Antonio and acquired books for the University of Tennessee Press, is more scholarly. “We really complemented each other,” said Hunt. Two Schools balances historical writing with some 200 photographs and drawings to bring to life the personalities, activities, and traditions of earlier eras at the two schools. The result is an addition to the short list of indispensable books on the history of our region. Two Schools on Main Street is available by mail order for $39.95, plus $3.30 tax, and $6.00 shipping. Send orders to Herald Democrat, 331 W. Woodard St., Denison TX 75020 or call for information (903) 465-7171.